I’ve only recently started reading Brandon Sanderson’s books, but I’ve liked what I’ve read so far. I started out with Warbreaker, which was a relatively light fantasy novel when compared to the hefty tome that is The Way of Kings. While I loved the moderate pace that Warbreaker moved at, I instinctually knew that most “high fantasy” books are usually bogged down with exposition and world-building. 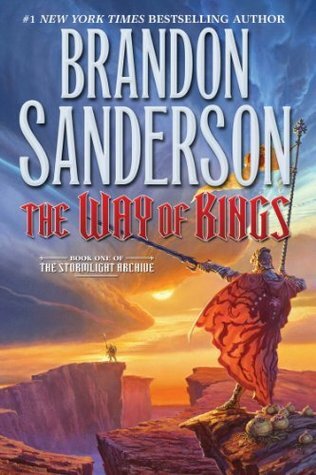 The Way of Kings is certainly a “high fantasy,” which makes me wonder if perhaps Sanderson tried to do too much in this first volume of his newest series. The Way of Kings follows about three main storylines but could have potentially gotten away with two of them, even if the one that could be easily cut—the Soulcaster theft storyline—had some of my favorite characters in it. I could also see the plotline being pared down to the one following Kaladin (who appears in each of the parts) since a lot of the “royal” plotline mostly just provided the world-building and exposition needed to ground the reality of the setting. In the end, this is just three books intertwined together to make one big book. Perhaps because of its length, it took me the better part of eight months to finish reading The Way of Kings. Granted, I mostly only read it on my Kindle when I was flying somewhere, but I wasn’t necessarily drawn to keep reading once I returned home. All this being said, the magic system is well-developed, the world is creative and rich with details, and (most of) the characters are incredibly entertaining. Under different circumstances, I’d give my rating an additional half a star, but since reading it felt a bit more like work than entertainment, I’ll leave it where it is. A creative “high fantasy” that perhaps bites off more than it can chew, I give The Way of Kings 4.0 stars out of 5.